When you walk into the studios of FIU’s student radio station, it’s clear the place is rich with history. There’s the vintage equipment, intricately labeled as to avoid any on-air mishaps; the old-school records jammed into the bookshelf; and the thoughtfully arranged souvenirs from former DJs — scrapbooks, calendars and prayer cards. 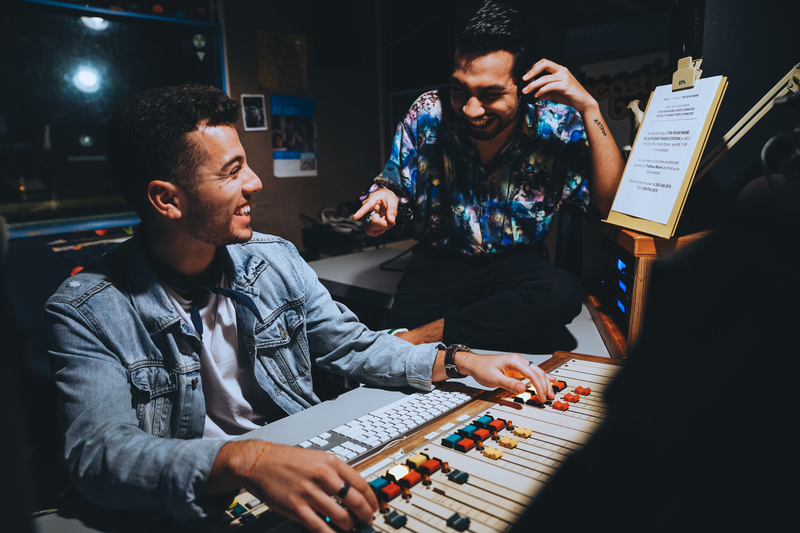 Known previously as WUFI, Radiate 88 and WRGP — and now as The Roar Miami, FIU’s student radio has gone through many incarnations since its start in 1988. Over the years, students of all ages, majors and backgrounds have found refuge in this ever-changing community of audiophiles, sharing music from diverse times and places far beyond FIU’s campuses. And this year, as the station celebrates its 30th anniversary, it’s a time of reflection for many of its current and former student DJs. The idea for what was then WUFI 540 AM began in 1987 as a student government project spearheaded by Stuart Blank, a transfer student from Long Island who wanted to create a college radio station modeled after one he listened to back home. “We just tried to give people an alternative to listen to in the dorms,” says Ben Sardiñas, one of the first managers at the station, and now managing executive of Healthcare Mergers and Acquisitions and vice president of the Alumni Association at FIU. Blank joined forces with his friends John Villate and Charles Michaels to propose the project, which was later approved by student government. After being granted the space to build it, the station was designed by students, including Roy Pressman, who has worked as consulting engineer to the station since its debut in ’88. The group of students installed all of the equipment in a month. “We sat there and just punched out all of the cablings and installed all of the equipment,” Sardiñas says. It was Christmas Day 1988 when the arduous project was finally finished. At first, the signal only covered FIU’s main campus. However, that didn’t limit the young station from playing music they felt had to be heard. Like most college stations, their programming aimed to promote and discover music outside of the mainstream. “We didn’t want to play whatever was popular back then like Tiffany or even U2, which had become mainstream even though they had an alternative sound,” Sardiñas says. The late 1980s, in particular, were a crucial time for college radio, when alternative music was in demand and new styles were emerging every day. And although student government had gathered enough money to put up an FM antenna for the station, they struggled to get permission from the FCC to put up the FM tower and broadcast under a new signal. It wasn’t until a decade later that a new group of DJs took on the challenge again. In 1998, general manager Brian Smatt started the station’s first-ever sports department out of nothing but sheer enthusiasm. It soon became home to a growing group of amateur sports broadcasters eager to spotlight FIU’s athletic events. Before they had the proper equipment for broadcasting, Smatt and his friend Ira Haber would practice their discourse by speaking into a tape recorder at basketball games. Smatt said there was a growing need for sports coverage. The department covered several games both at home and away. One they proudly look back on is 1998’s victorious 69-62 defeat against the University of Michigan. Smatt and co. narrated the game courtside. “Panther Talk,” also created by Smatt, was WRGP’s first-ever sports talk show. The first interview on the show was with Don Strock, FIU’s debuting football coach. Smatt later worked at a TV station, WAMI where he also interned. He also worked with FIU athletics as a graduate assistant. Messod Bendayan, sports director between 2002-’04, and later manager as well, covered the first-ever FIU football game play by play. In its first years, WRGP’s sports crew would only broadcast about 10 to 20 games a year, a number that Bendayan says reached more than 100 under his management. Having worked as a successful sports anchor, Bendayan also worked for the Carolina Panthers of the NFL as a gameday producer and Sirius XM for its college sports channel. He currently works as news director of six stations in Daytona Beach. “Being at WRGP was excellent training for going into news and sports broadcasting, which I’ve done ever since,” said Bendayan. 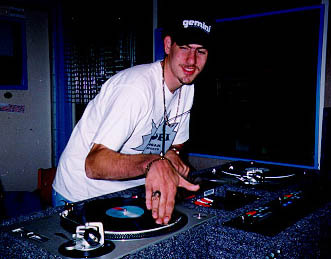 Ian Grocher was working as a DJ at a local skating rink before he joined WUFI back in the mid-90s. “When I got there, it was an AM station that could barely get around campus,” he says. Grocher later became general manager and was persistent in his goal to get the station a spot in FM radio. In ’98, he and his team lobbied the vice president of Student Affairs and finally got their wish granted. Radiate 88 FM / WRGP was born. Grocher adopted the moniker of DJ Irie during his WUFI days; he went on to work at 99 Jamz. For nearly 18 years now, he has been the official DJ of the Miami Heat. Orlando Machado, Jr. in the studio. Orlando Machado Jr., who later joined the AM station in 1998, vividly remembers the first days following the transition. This was what the DJs had in mind when first fighting to expand the scope of their programming. “It was incredibly rewarding to have that first bit of feedback, to no longer simply be entertaining the void,” Machado says. With this new accomplishment, they were eager to further curate their content and stand out on the airwaves. “If someone wanted to listen to some popular music, they had plenty of choices. Why would they bother tuning in to our little station to hear the same thing?” says Machado, who was also general manager during the early FM years. 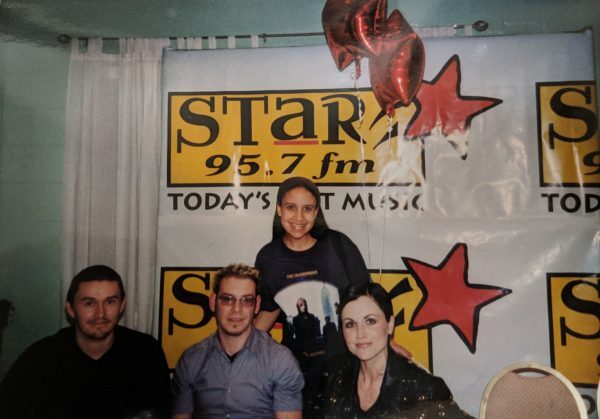 Ayxa Vecino meeting The Cranberries, who she interviewed for WRGP. Vecino, who is currently the senior special events manager at the Graham Center, says the station played bands like Linkin Park and Less Than Jake when they were first starting out, before their massive successes. In 2012, Radiate FM / WRGP was voted the best radio station in Miami by the Miami New Times. Around this time, as the internet began to take over the world, the station set a new goal: online streaming. “It wasn’t perfect, but we were one of the first radio stations in Florida to have an internet presence – expanding that reach even more,” says Machado. In 2017, the station was renamed The Roar Miami and its staff members are now directing their focus internally, using events and social media to raise awareness of the station’s role within the university. “We want to make sure that our listeners understand, whether they’re in Hialeah or New Zealand, that you can listen to it anywhere and you can connect it to FIU,” says Alfred Soto, visiting professor in the Department of Communication. Soto was previously a student media advisor who guided the programming and management of the station for nearly 12 years. Before that, he was a DJ as part of WUFI. Reaching students now involves more than just a solid on-air presence and online stream. The Roar’s newest manager is Harold Daniel, a senior in communication arts who wants to reassert the station’s importance within the university. “Now that we’re going into a more digital era of media and people are always saying radio is over, we have so much potential with 57,000 students at FIU,” Daniel says. Most importantly, he wants to change the fact that many students don’t even know there’s a station on campus. “Harold brings a flair to the job that at this moment in The Roar’s history we needed,” Soto says. Social media, Daniel says, is the key to connecting with both students and a broader audience. On-air promo for instrumental hip-hop and future bass show Beat Format. 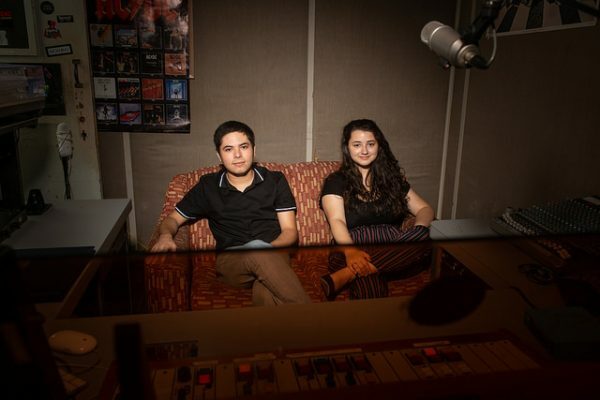 “Now when people go into our social media accounts they get to see these DJs and get to know them briefly and see and why they joined the station and what college radio means to them,” Daniel says. They’re also hoping to further connect with the local music scene. Their signature show, The Pipeline, invites local acts to perform live in their studios for two hours. “It promotes the mindset that local music is something special – it’s true to Miami,” says Anabelle Torres, who currently co-hosts The Pipeline alongside fellow DJ Andres Nuñez. They both joined the station in 2016. “I don’t know college without radio,” Torres says. Andres Nuñez and Anabelle Torres, hosts of The Pipeline. 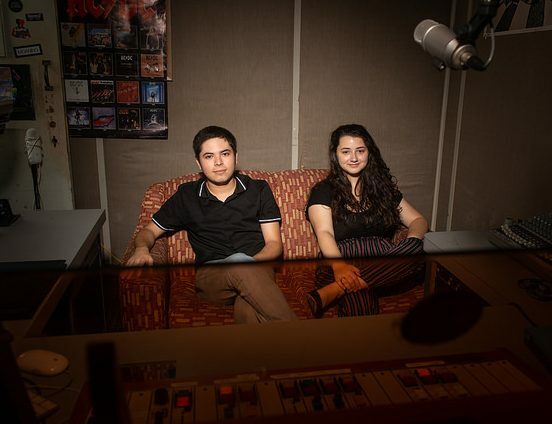 “Just finding a community in a really big university where it’s just people who think similarly and listen to similar things has been great,” says Nuñez, who also hosts a surf-rock show at the station. On-air promo for surf-rock show Coastal Drift. “Some people join sororities or fraternities to find their friends and this was kind of the thing for me,” he added. Daniel, who hopes to work as an entertainment journalist, will be interning at Good Morning America in New York City this fall. He says his time at the station helped him land the position. Throughout its 30-year run, those who have inhabited the studios of The Roar have been impacted by its profound sense of community, particularly toward those within marginalized groups. Outside of his duties at the station, Daniel, who joined The Roar in 2016, is an advocate for LGBTQ+ issues, being the president and founder of the National Lesbian and Gay Journalists Association student chapter at FIU and a GLAAD campus ambassador. “It’s an important part of FIU’s culture, especially for student life,” Vecino says. And in a time where media is shifting, it seems the medium of college radio is more important than ever. “It might not necessarily entice the masses of the student body, but there is still an interest in wanting to tap into the fabric of the university and the sound and vibes of what’s going around in the immediate surroundings,” Grocher says. “For those students who really sign up for the full college experience and really have that sense of pride for their university, having a campus station is a big part of that,” he added. Its current members welcome and encourage students who are enthusiastic about independent music and alternative radio to apply to The Roar. “You’ll get exposed to so many different kinds of music and discover artists you wouldn’t have otherwise,” Nuñez says. The Roar Miami will be hosting an anniversary bash on College Radio Day, Friday, October 5 at Vicky Bakery to celebrate its anniversary. Six local bands will be performing at the event. Patricia Cárdenas was a member of WRGP / The Roar Miami from 2016-2018. Student Media in the News: Sept. 11, 2018 – College Broadcasters, Inc.